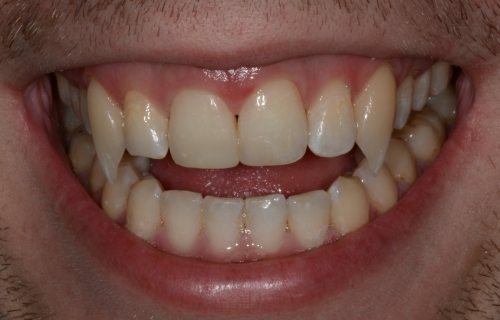 When I was in private dental practice, every Halloween we would create temporary vampire teeth for patients who wanted them for costumes. It was about a fifteen minute procedure, and didn’t require any novocain or drilling on the teeth. Then, the day after Halloween, we would remove the fangs, which took another ten minutes. First, we would clean the canine teeth off with Supersmile whitening toothpaste. This gently removed the protein pellicle layer without being abrasive. Then, I would etch each canine tooth and apply a bonding agent. On top of that, I would apply a small amount of red tint. The purpose of the tint will be clear later. Over the red tint, I would apply a tooth-colored composite and create the shape of a fang. If I kept the composite toward the facial surface of the canine, it generally wouldn’t get in the way of the bite. Sometimes I could make these vampire teeth quite long without any problem. Sometimes the patient’s bite was more restrictive, and I was limited in how long I could make them. Since the vampire teeth were just temporary, they required only a light polish, and the patient was dismissed. The whole process took me maybe ten minutes, which enabled us to do this for a fairly modest fee. We were careful to do these fangs only for entertainment value, insisting that the patient sign an agreement to have them removed right after Halloween. We ran into one or two people who were associated with strange cults and wanted permanent vampire teeth, but we didn’t want to get involved in doing that. The day after Halloween, the patient would return, and we would remove the fangs and polish the teeth. Having the red tint underneath the overlying composite made this procedure much quicker. I would drill away the composite with an aggressive, coarse diamond bur until I began to see the red tinge. At this point, we would shift to carbide finishing burs and sandpaper disks that would remove only the composite and wouldn’t remove any tooth structure. This made the removal quick, economical and safe.